That you knew your skills and qualifications stacked up equally and your ambition and commitment to the business were also on par? That this disparity wasn’t even a secret and had already been acknowledged by management to be unfair with a verbal promise to rectify at the next round of pay rises only to be told a few weeks later that someone further up the chain had said “no”. Add to this you are a new mother recently returning from maternity leave to a company who has made a public commitment to the ‘gender agenda’, yet internally is allowing this bad practice to continue. On the 6 April 2017, The Equality Act 2010 (Gender Pay Gap Information) Regulations 2017 comes into force putting in place the requirement for employers with more than 250 employees to publish their gender pay gaps and explain their reasoning in a simple statement for them. Businesses have up to 12 months to display the information on their website with speculation that failure to report could result in reputational damage and the appearance that there is something to hide. Equally though it can feel a scary proposition to reveal the inequalities that you or your employees know are there. Can and worms come to mind. I believe businesses now have 2 very clear choices: Value talent regardless of gender or watch that talent to go elsewhere and be in competition with you. Rather than focusing on the reputational damage business could face, smart businesses would be wise to follow the example of Salesforce CEO Marc Benioff who has garnered huge amounts of positive publicity for his commitment to parity. At Davos in January he announced that having acquired several new companies the software company, who 14 months previous had spent around $3 million tweaking employees’ compensation to eliminate any gender pay gap, would again alter salaries for the same reason, investing around the same sum. Perhaps seemingly small change to a company that has a market cap of $52 billion but personally I’m impressed. Acquiring other firms means inheriting other cultures and pay practices but Salesforce has pledged to review its gender pay gap on an on-going basis to ensure the parity they seek, remains. 3M were recently awarded a Catalyst award for their commitment and improvement to gender parity through a global initiative to recruit, develop and advance women companywide. Having delivered a pilot leadership training to support their managers, focused on retaining and promoting female talent, it is clear there is still work to do but as a business they are “on the journey”. They have a great opportunity to build on their progress and commitment to improve, and take their leadership in this area further. Here are 3 things you can do to as a business and employee to ensure your business is paying men and women fairly for their skills and provides equal support to your talent -so the regulations can be good news. It may sound simple but many businesses I meet struggle to readily access or share simple data about their employees that gives an accurate picture of their pay, status and progression. When I speak to businesses about their culture and the numbers they’ve collated around maternity and paternity progression the information presented often gives a skewed view of the actual situation and the issues to address. Rather than wanting to paint the best picture ask where is there room for improvement and who can help me achieve this? Consider the return on investment rather than the upfront cost and work with a provider who is committed to delivering results and helping you achieve your goals. 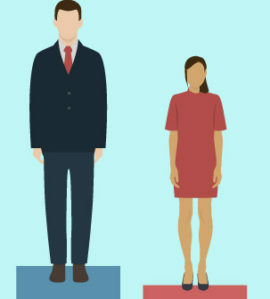 As a business ask your employees to contact you if they suspect there is inequality in pay rates which is based on their gender, and not their skill set, or if you become privy to information which highlights unfair practices, and commit to taking it further. Create an environment that is open to discussion and known for taking action around this topic and educate your management to have the same approach. Build a network of allies within your business, amongst your board or within your industry who are committed to fair practice and creating gender parity. We all know unconscious bias exists but ensure your business is doing its best to move forward and make changes. As an employee negotiate and stand up for your worth. The women I coach admit they can struggle to challenge inequality in pay, position, or day-to-day responsibilities but if the reality is you are being unfairly remunerated this needs to be addressed sooner rather than later and with those who are able to create change. Find the support you need to ensure you present your case professionally and if you need to seek legal advice to strengthen your position and give you the additional confidence to speak up, do. Ultimately business should thank you for giving them the opportunity to make corrections, but if they don’t, and your requests for action continually fall on deaf ears, take a leaf out of the notebook of Susan Fowler who after moving on and securing a new position, reflected on her very, very strange year at Uber. The rest they say, is history. Update policies and procedures to better address inequality and be prepared to take bold moves if they are no longer serving your business. Max (Mills) Miller, dad of two and co-founder of ustwo only really understood the value of equal parental leave when he realised he’d missed out on it. As a result the business recently made a commitment to give new mums and new dads the same paid parental leave – a full 6 months, which is a great start. Having a predominantly male workforce it’s a bold move but one that I’m sure will reap rewards. Equal pay will never come about if we don’t address the way we parent and share child care so start with a policy and culture that encourages women and men new options. Another company I spoke to shared they had reduced their maternity packages in order to increase their paternity offering which was an equally gutsy move but is showing the company’s commitment to levelling their options and internally paying dividends. Reducing someone’s pay may not go down well or even be possible but include all your staff in your plans and decision-making. If a man objects to a woman being paid equally ask him to explain why. The new gender pay gap regulations will undoubtedly cause business some work but they also present leaders with an incredible opportunity. Rather than paying lip service to gender equality, diversity and inclusion, businesses have a new platform to show how well they value their women and talent overall. No-one is expecting perfection but transparency, honesty and a willingness to improve would be a great start and could be very good news for the businesses who embrace this. If you are concerned at how your business will fair, book a free Survey and Culture Reviewto see exactly where you are and the changes you need to make*.